I just watched Scott Pruitt, head of the Environmental Protection Agency, get eaten alive by Fox News Sunday anchor Chris Wallace. Not only was it an ugly and painful sight but it was also a very dispiriting one. Here is the guy who was carefully selected to be in the vanguard of President Trump’s war on the Green Blob which, for decades, has been doing untold damage to liberty, the scientific method, and the economy. And he can’t even answer a few basic and obvious questions about why the job he is doing is necessary, important, and right. Wallace asked him about the UN’s view that it was 95 percent likely that more than half the temperature increase since the mid-20th century is due to human activity. Pruitt sweated, stuttered, and floundered. Wallace asked him about NOAA’s claim that 2015 and 2016 are the hottest years on record. Pruitt had no convincing comeback. Pruitt just didn’t know how to respond. There should have been nothing complicated or unexpected about these questions. They are the kind of thing any half-way decent interviewer might have asked, be he a hostile one or a semi-friendly Fox News one playing devil’s advocate. And if Scott Pruitt had had even the most cursory briefing and media training in his new role, he should have been prepared for them. Not only should he have known the most effective answers to give; but he should have been so confident in the rightness and truth of his cause that he should have been able to seize the moment and make the points that really need to be made about President Trump’s environmental policy: that it is being enacted for the good of science, for the good of the economy and the core mission of Making America Great Again. How could Scott Pruitt not do this? Any one of us on the skeptical side of the argument could have pointed him to dozens of leading scientists — and hundreds if not thousands of papers and articles — that could easily have enabled Pruitt to say what needed to be said. He could have noted the incompetence, corruption, and mendacity of the heavily politicized IPCC; the dishonest manipulation by organizations like NOAA — indeed especially NOAA — of the raw temperature data; the utter meaninglessness of the “hottest year evah” claims so often made in the liberal media. And he could easily have batted off the “What if you’re wrong?” question by making perhaps the most important point of all that needs to be made about the “war” on “carbon”: that what it all comes down to is cost benefit analysis. To whit: the trillions of dollars being spent every year on the possibility that there might be a problem, a) could be spent much more usefully elsewhere and b) are doing more harm than good. Pruitt was incapable of doing this though because, trained lawyer though he is, he is simply not on top of his brief. This is disgraceful. It’s an embarrassment and a shambles. Worst of all, it’s an entirely needless concession to the enemy. See how it’s being reported by the Soros-funded propaganda site Think Progress. 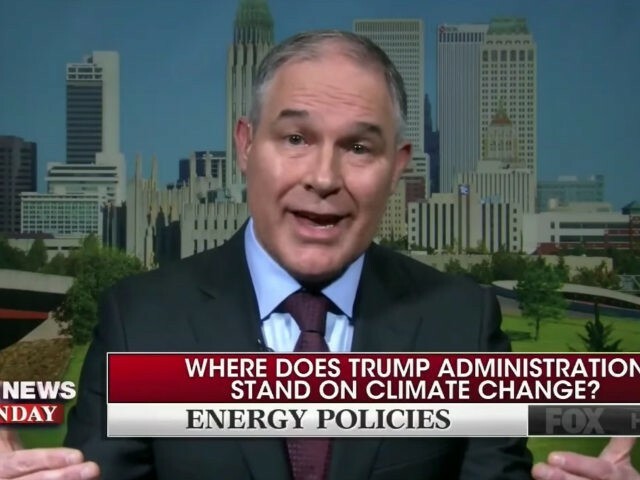 Even Fox News can’t believe that the head of the Environmental Protection Agency, Scott Pruitt, doesn’t accept the basic scientific finding that carbon dioxide is a primary contributor to recent global warming. Pruitt may have thought the Murdoch-owned network that has led the way on attacking climate science for two decades would be a friendly audience. He was wrong. And on this occasion, the Soros attack dogs are quite right to be yelping so excitedly. I’ve reported before on the worrying signs that Scott Pruitt may not be up to the job of EPA Administrator. His performance on Fox seems only to confirm it. If the Trump administration is serious about dealing with the vast and out-of-control Climate Industrial Complex which has done so much harm to the U.S. and the world these past few decades, then it is going to need to seriously up its game. It’s not enough to talk the talk. Not when there are so many individuals and institutions — 99.99 percent of the EPA, for one — which are determined to sabotage every one of the President’s good intentions. Unless the Trump administration can frame the war on the Green Blob as something more than merely a sensible cost-cutting exercise or — as Pruitt is determined to think of it — a reassertion of states’ rights, it is almost certainly doomed to lose it. There is so much corruption, dishonesty, rent-seeking, bad science and malfeasance on the greenie side of the argument that, really, it represents a barn-door-sized target. To miss at this point wouldn’t merely be stupid. It would be totally unforgivable.